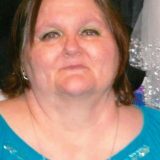 A private services for Karen H. DeWitt, age 60, of Sulphur Springs, will be scheduled at a later date. No visitation is scheduled. Mrs. DeWitt passed away Monday, June 5, 2017 at Christus Mother Frances Hospital in Sulphur Springs. She was born June 30, 1956 in Fort Worth, TX, the daughter of Robert Hinson and Oneta (McAlpin) Hinson. She married Kenneth L. DeWitt on August 7, 1997 in Winfield, TX. Karen was a housewife and of the Christian faith. Survivors include: husband, Kenneth DeWitt; sons: Clyde Hogue of Pittsburg and Paul DeWitt of Sulphur Springs; daughter: Chyna Sires of Sulphur Springs; grandchildren: Austin Hogue, Zoey DeWitt, Autumn Sires, Bentley Sires and John Paul DeWitt; sister: Kristy. Mrs. DeWitt was preceded in death by her father, Robert Hinson.